Lexus: The Lexus cars and SUVs of today may have the same flawless quality, remarkably comfortable cabin and iron tough reliability of those products that bore the label years ago...but that's where the similarity ends. Lexus, once chided by car enthusiasts as being appliances on wheels with "meh" styling, now helps set the trend for automotive designs which thrill, draw attention and yes--stir up more than a little controversy. Wild as some of the styling may be, they do bear the test of time as other brands introduce designs that Toyota's luxury line pioneered ages ago. For instance, did you think years ago that you would ever see anything like the dazzling, zoomy LC 500, an ultra-luxurious powerful coupe in a Lexus dealership? No? Neither did we! 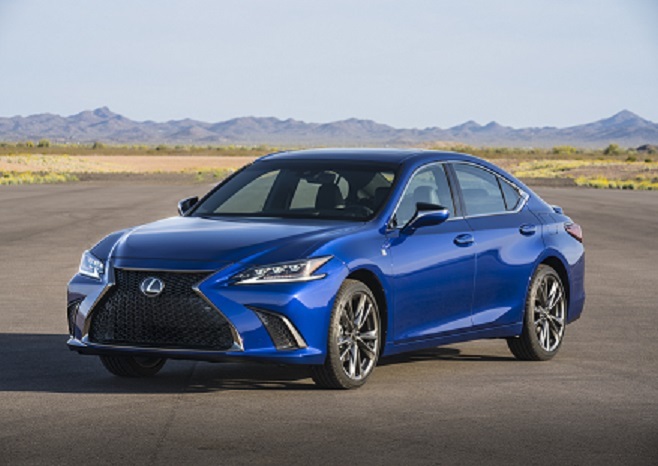 For 2019, Lexus has showered some of its leading edge design on the popular ES sedan. It has an all-new platform called Toyota New Global Architecture, a dramatic new silhouette, an all new racy front end dominated by Lexus' familiar spindle design, and an eye-catching couple like roof line. Prices range between about $37,000 to around $45,000 with no options. Power comes from either a 2.5 liter, 215 horsepower four cylinder hybrid powertrain, or a 3.5 liter 302 horsepower V-6 with choices of either an eight speed automatic or a CVT automatic transmission. The combined fuel economy rating is 26 miles per gallon for the conventional model. The ES is the first Lexus to get Toyota's Apple CarPlay connectivity system. And what little nifty factoid: There actually is a sports oriented version called the F Sport, a name carried by similar models throughout the Lexus line. You will also be pleased by the ES's long list of standard safety features. They include Lexus Safety System+, automatic braking with pedestrian detection and forward collision warning systems. And you will find this newest ES to be roomier and quieter--if that's possible--than previous ES models. The high end LC, designed to showcase the car's powertrain an suspension systems, and shifting is somewhat more precise and smooth thanks to changes made to the programming of the 10 speed automatic transmission in the car. And if you like strong road performance, you will pleased to hear that adjustments have been made to the steering and braking systems for more road feel and even better responsiveness. And now for the other big Lexus news: the 2019 Lexus UX, a luxurio9us compact CUV aimed at the growing market of small utility vehicles. It is replacing the Lexus CT200h hatchback which was the least expensive way to go Lexus in years past. Probably the first thing you will notice is the angular, Origami flavored styling that sets the UX completely apart from anything else on the road. It is controversial looking, that's for sure! But the UX has a lot more going for it than just design. It has anew infotainment system that includes Amazon Alexa integration and Apple CarPlay, and sports enthusiasts can purchase an F Sport model that has 18-inch alloy wheels, adaptive variable suspension, and a Sport S+mode. Unfortunately, there's only one all-wheel drive version of the UX , and that will be the UX 250h hybrid. Power comes from one of two options: A 2.0 liter, 168 horsepower four cylinder variant, or if you choose the hybrid, you get a hybrid powertrain system that includes the 2.0 liter four. Fuel economy ratings are 28 city for the gasoline model and 45 for the hybrid in the city, to 34 highway for the conventional model and 42 highway for the hybrid UX. Prices range from about $33,000 to $36,000 without options. Speed? 0 to 60 in 8.0 to 9.5 seconds, depending on the version you purchase. The rest of the Lexus line--the NX, the RX, the LX, the GX, IS, and the LS, are either totally unchanged or have only minor variations in things like trim and colors. 2013 Dodge Charger SRT8-- Fast, furious, and absolutely fabulous!